Magnetoencephalography (MEG) and electroencephalography (EEG) are non-invasive methods to analyze the temporal and spatial extent of neuronal activity in the brain. Source reconstruction enables us to decompose and locate the electromagnetic sources representing neuronal activation. Highly accurate source reconstruction is possible with finite element (FE) simulations in which the head as a volume conductor is decomposed into volume elements of a certain size, which each have individual conductivity properties. The question arises of how fine the FE discretization needs to be to produce optimal source reconstruction results. A series of cubic FE models with side lengths of 0.25 to 1 mm of a rabbit's head were constructed from a pre-existing MRI data set (0.33 S/m skin, 0.0042 S/m skull, 1.79 S/m cerebrospinal fluid, 0.337 S/m gray matter, 0.14 S/m white matter). An 11 × 11 EEG grid was simulated on the scalp. A 4 × 4 array of gradiometers for MEG were modeled 1 cm above the scalp. Additionally, the electrocorticogram (ECoG) was simulated with an 8 × 8 grid on the cortex. Dipolar sources were regularly placed in the cortex (724 positions) and in the thalamus (68 positions). The reference EEG/MEG/ECoG was computed noise-free on the FE model with the highest resolution using SimBio . The deviation of the simulated EEG/MEG/ECoG of each of the FE models to the reference was quantified by the relative difference measure (RDM*) and the relative magnitude error (MAGrel) . Results (Figure 1, MAGrel and MEG not shown here) show that the discretization-induced error (RDM* and MAGrel) in EEG/MEG/ECoG decreases with smaller side length for cortical and thalamic sources. Saturation is reached below 0.475 mm. Between 0.5 mm and 0.775 mm, the error shows strong variation, except for thalamic sources in EEG. In this range, structural details are partially captured or not at all. 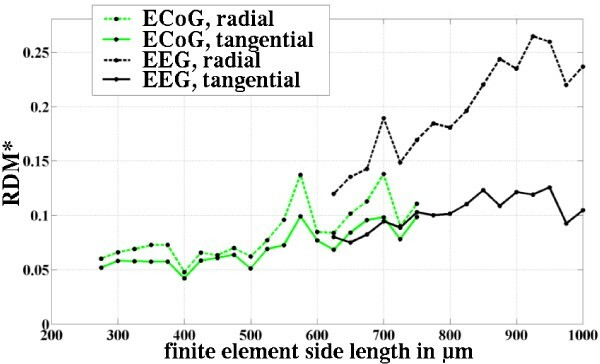 FE discretization-induced error (RDM*) of EEG and ECoG averaged over cortical positions. The sizes of tissue structures that significantly influence the EEG, MEG and ECoG in this rabbit model are above 0.475 mm. For human EEG/MEG this is a lower bound, because their spatial sampling rates are lower in relation to tissue structure dimensions. However, much larger structures such as open fontanelles of the neonate skull, post-surgical structures and brain lesions should be included in the model to be realistic. The most widely used boundary element models make simplifying homogeneity assumptions that do not allow this necessary level of detail. This work was supported by the DFG.